After an intense opening sequence, wherein our protagonist, Stanley, and his wife Leonore experience engine failure on their cargo plane and start to lose altitude, and somewhere in the middle of the plummet the cockpit tears apart from the rest of the craft, spinning around in sickening slow motion to show us Leonore strapped into her seat in the back reaching out and, presumably, screaming in terror. It’s a harrowing and poignant opening to a game. 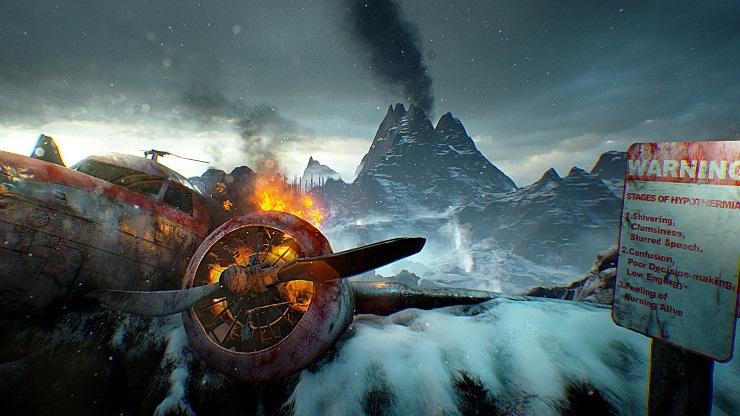 Awakening, you find your plane’s cockpit is smashed into the snowy landscape of an Icelandic island and the rear portion within which was your wife is nowhere to be seen. Finding a radio that can only receive, and not transmit, you hear the fearful voice of your wife. She’s alive, but unable to get out of the confines of the seat and, in the subzero winds that are currently thrashing at you, you know she doesn’t have long to live before hypothermia takes hold. She tells you of a plume of smoke nearby which you can see is billowing at the top of a mountain, and thus your goal is set. Find your wife and rescue her from her current predicament. Upon taking a few shaky steps in the freezing snow and first discovering that being away from a source of heat would mean certain death, Leonore mentions the diary that she kept. Should help arrive, these pages needed to be destroyed lest they incriminate the both of you because your wife, in her infinite wisdom, wrote about your past and your reason for escaping Northern Ireland in the first place. Stanley must have been thinking “You daft mare,” at this point. I know I would have been. 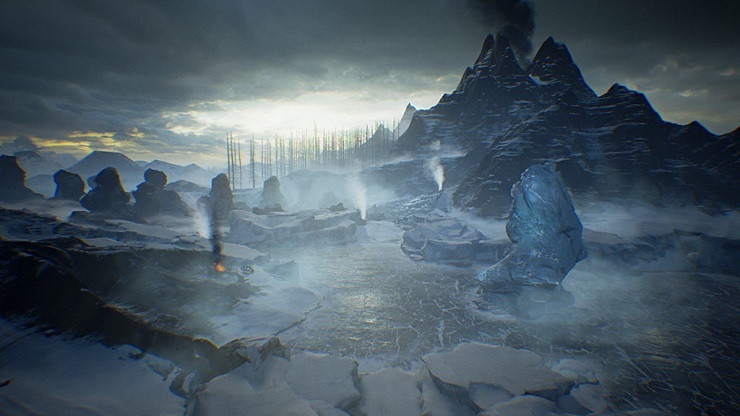 Atmospherically, The Fidelio Incident excels among the best of the walking simulator sub-genre – and I am loath to use this term to describe a game – in recent memory. The harshness of the snow, the extreme temperatures creating beautifully frozen streams and shorelines that shimmer in the daylight, and the sound of that very same plateau of ice creaking and cracking and dropping you into the waters when you make a wrong step is incredible. As someone who suffers from thalassophobia, the deep rumble and crack of ice breaking and reverberating through the water below and the inevitable CRASH, DUMPF, followed by the sound of water rushing around the ears is one that gave me chills unlike anything since ABZU. As you traverse across the island, everything starts to become a little bit too convenient. Heat sources become plentiful and very, very clearly mark the way, taking away any promise of exploration and sense of danger almost trivialising the experience as you walk from burning wreckage to steam pipe to natural steam geyser. Each conveniently placed, perpetually burning piece of your plane – which, at this point seems you have been made entirely of candles and petrol – will have a page from your wife’s diary that inexplicably has remained undamaged, dry, and moving no more than a couple of feet from the wreck. The exposition dumps and backstory offered from the diary pages was, in my opinion, the best part of the game. They are all read by Leonore and the emotion in each line, coupled with a beautiful Irish accent lends gravity to each new entry you discover. The delivery of lines from Leonore, and the internal struggles of Stanley who talks to himself in response to what he reads and sees offers a performance that sets, that show the love between husband and wife. Each page is handwritten, carefully put together with artistry and supporting drawings – presumably Leonore was an artistic woman – and gives a new little piece about the couple’s life together. At the time of The Fidelio Incident, the pair are middle-aged, but the diary offers their younger life from the eyes of Leonore. Their first meeting, their courtship, and the pains they felt during a difficult time. The Fidelio Incident touches on a topic that I’ve not yet experienced in a game; it tells a story of love blossoming during the Troubles, a time of great strife in Northern Ireland that lasted decades overall. It approached it with unbiased and artistic class, and I can do nothing but respect that thoroughly. Beyond these positives, though, comes the inevitable negatives that can’t be ignored. Atmosphere and narrative alone cannot help save The Fidelio Incident from itself. Where it delivers wonderfully in story, it more than takes away in the mechanics themselves. Walking between one heat source to another, occasionally turning valves and clearing pathways, is a massive let-down to the overall experience. Puzzles become completely redundant and trivial after the first 30 minutes and serve nothing but to make you walk farther than you’d like. It became an unnecessary tedium that could have been replaced with other, more dynamic means of progression through the story. As previously mentioned above, it takes away from any real exploration when you know that you have to get past a particular puzzle. Once you’ve done so there is little reason to continue risking the dangers of freezing to death in the name of exploration. We have a plethora of survival and exploration games – too many of them, some might say – where inspiration for survival mechanics could have been borrowed to make an even more impactful experience. Sadly, though, the focus was on the metaphor that the game showed itself to be. Beethoven’s only opera, Fidelio, is an obvious inspiration in which the character of Leonore is heavily referenced; particularly in a section of the diary midway through the game. This is the only reference to the opera that I could detect, so more parity or inspiration would have been a great addition. As the metaphor develops, things start to become more surreal. There is a point about two-thirds into the game that puts you right in the middle of one incident back in Ireland in Stanley’s past that truly hammered home the weight of Leonore and Stanley’s past. Again, this showed the real mastery of the narrative which, unfortunately, served only to highlight the shocking shortfalls of the mechanics. 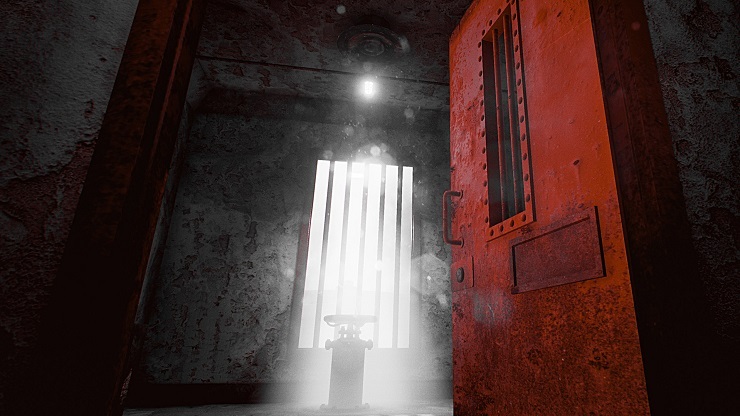 In total The Fidelio Incident took approximately three hours to complete, an experience that you can sit through in a single session without any real struggles. The question is whether it’s worth doing so. While I enjoyed the story thoroughly, I felt that the actual gameplay got in the way of what could have been a stunning masterpiece. Puzzles were trivial and started to border on the realms of tedium, rather than add layers to the overall experience. In a market of games in this sub-genre of walking sims, the competition is fierce. 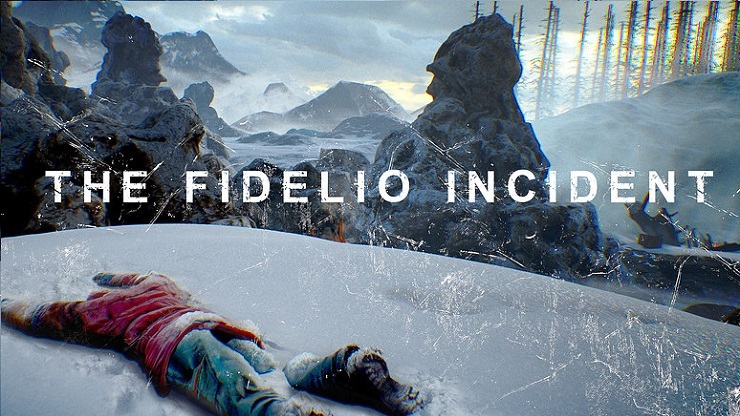 The Fidelio Incident offered little beyond a well-written and well-acted story that was far too sparsely scattered around disappointingly uninspiring gameplay.